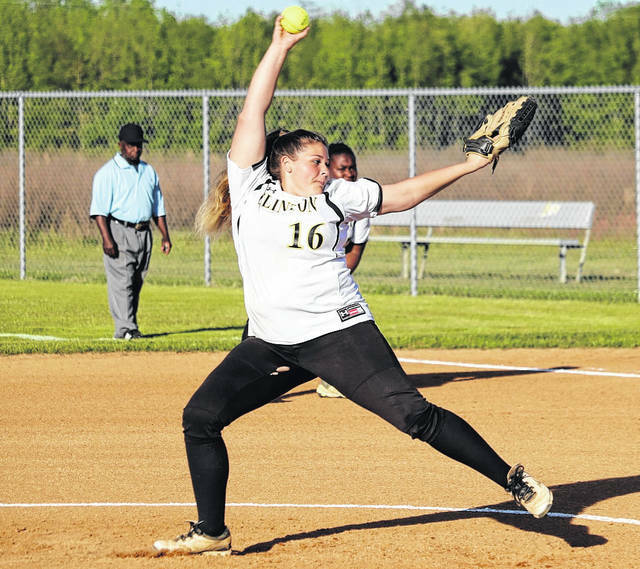 The Midway Lady Raiders notched another conference win on Tuesday, preserving their spot at the top of the East Central 2A Conference by besting county rival Clinton on the softball field, 13-2. Over on the soccer field, the Lady Dark Horses posted a big win over the home team, 9-0, also aiding in keeping Clinton at the top of the conference standings. 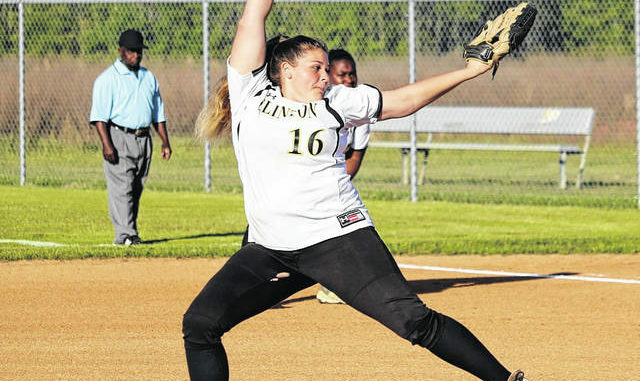 In the early going, it was Clinton that jumped out to a quick lead over Midway as the Lady Dark Horses tallied one run in the top half of the inning. Clinton held that lead for a bit but surrendered it in the bottom of the second as the Lady Raiders came calling. Alyssa Wrench got the inning started for Midway with a double into the outfield that turned into a three-bagger. Sydney Williams was next at the plate and she hit a nice shot into left field that scored Wrench. Midway fizzled for the remainder of the inning as the score was left tied at 1-1, but, things were quickly about to change. In the bottom of the third, the Lady Raiders came alive with a quick spurt and posted five runs to open things up. J.J. Sankey led the inning off with a triple. She was followed by a bunt by Jega Depuyan, but Sankey held serve at third for the time being. Caitlyn Holland laid down a bunt that scored Sankey and was followed by Wrench, whose popup behind first fell harmlessly to the ground in fair territory to cause more havoc for the Lady Horses. Alexis Jackson hit a SAC RBI to score Holland followed by Chloe Baggett batting in Wrench. A passed ball yielded the final run of the inning as Baggett took home, bringing the score to 6-1 headed to the fourth. Midway posted three more runs in the bottom of the fourth, and four more in the bottom of the sixth while the Lady Dark Horses tacked one on in the top of the sixth. With all the scoring concluded, the Lady Raiders ended the game with a 13-2 mercy-rule win in six innings to stay at the forefront of the conference. Leading Midway at the plate was Williams, Sankey, and Depuyan all with three hits. Wrench contributed two hits and Holland, Baggett, and Mackenzie Maynor all had one hit apiece. With the win, Midway is 10-3 overall and 8-1 in the conference, just ahead of Goldsboro who has two losses, and East Duplin with three losses. Midway was back in action on Wednesday hosting James Kenan. Clinton, with the loss, is now 6-7 overall and 3-5 in the conference. They were back in action on Wednesday as well, hosting Spring Creek. It was another blowout lead for the Lady Dark Horses on the soccer field as they bested the Midway Lady Raiders, 9-0. The score at halftime was 6-0. The final tally of the game came about midway through the second half as Clinton 9-goal mercy-ruled the Lady Raiders. Goal scorers for Clinton were Taylor Spell with three and Bailey Spell with two. Ashlyn Williams, Isabella Faison, Olivia Williford, and Chloe Holloman had one apiece. With the win, Clinton stands at 15-4-1 overall and 9-0 in the conference. Midway is 3-11-1 overall and 3-6 in the conference. Both squads were back on the field on Wednesday with Clinton hosting Spring Creek and Midway hosting Goldsboro. 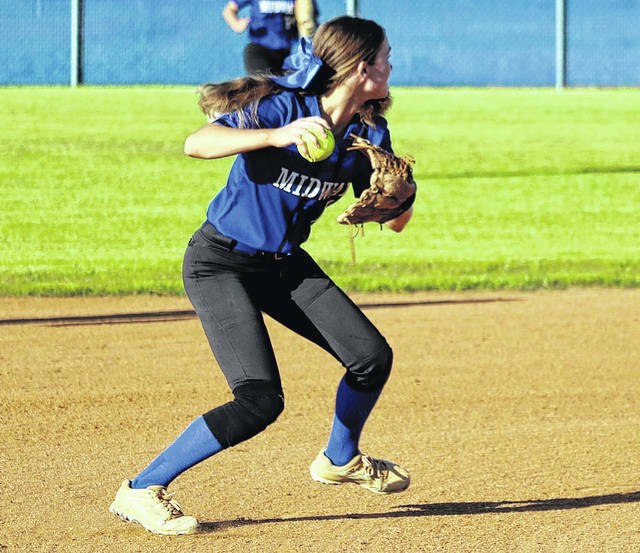 Midway shortstop Caitlyn Holland snags a groundball and looks to make the play. Clinton’s Hailee Stone fires the ball toward home plate during Tuesday’s game at Midway.